"Transcribed and edited from the original manuscript for MIDI playback by Hollis Taylor (MAC Finale). Featured in 'Skeleton in the Museum' by Jon Rose, ABC Radio, October 13, 2003" -- p. 1. CD: Madrugada : music from Latin America and Australia. 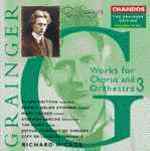 Parts: Random round : a join-in-when-you-like round for a few voices & tone-tools (instruments), tone-backgrounded (accompanied) by a gut-string guitar / by Percy Aldridge Grainger. CD: Skeleton in the museum / by Jon Rose and the Blisters Ensemble.